I would also like to clarify the use of the word Automatic. It's just about designating a semi-automatic shoot firing mode. In the world, they tend to call it Semi-auto shotguns. 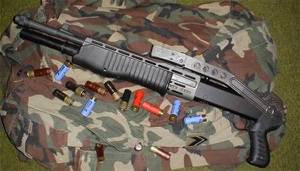 Of course, there is no fully automatic shotgun 12 in the world. Neither USAS 12 or anything else. Jackhammer is just a prototype. Do not you believe? I also did not believe it, but it is enough to start thinking. An automatic shotgun with a cadence of about 10 rd per second? I don´t think that. 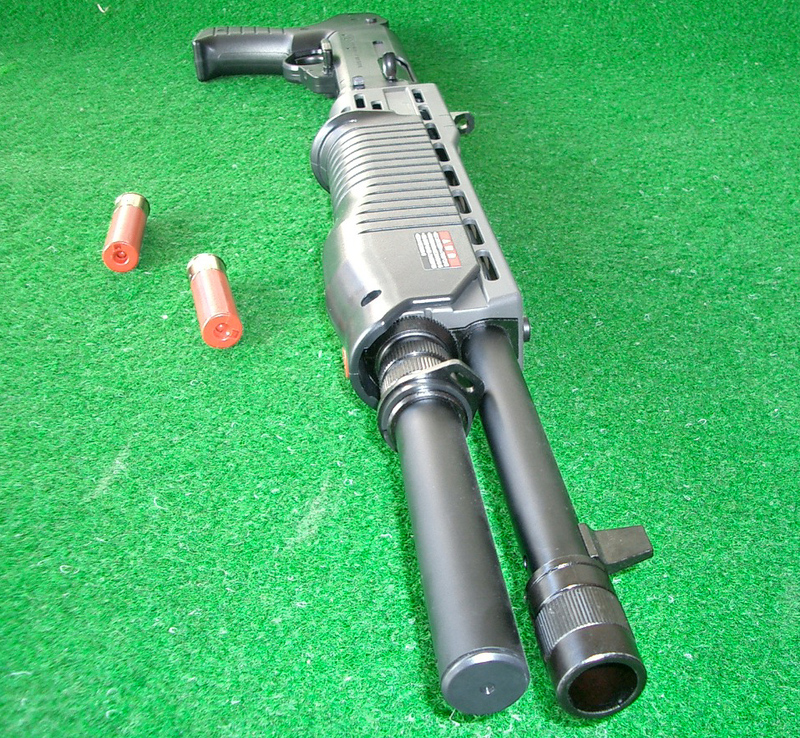 Shotgun SPAS 12 is manufactured in the Italian arms factory Luigi Franchi, based in the city called Fornacia. Shooting mode is possible to choose between repeating with sliding handguard and semi-automatic / self-charging using pressurized gases. The weapon weighs 4 kilograms and its total length is 1070 mm. 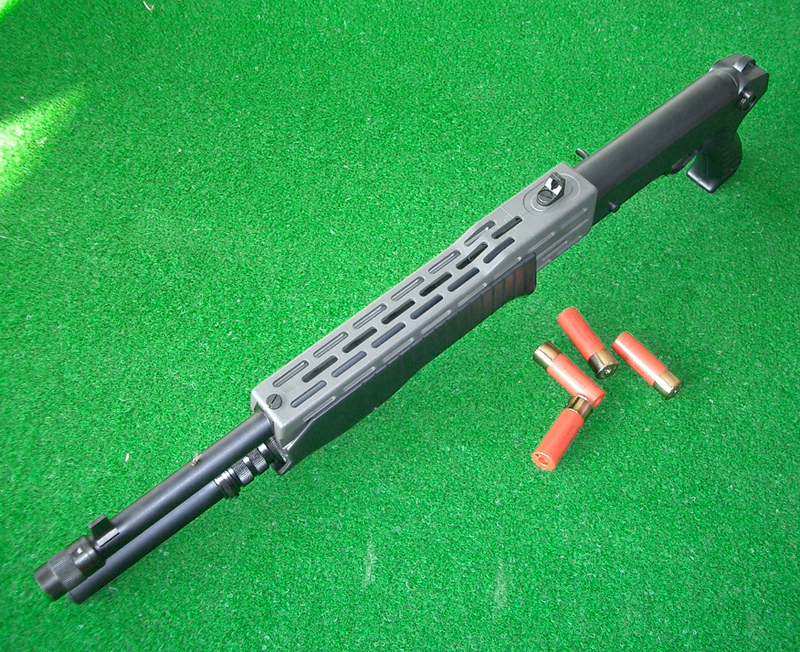 SPAS 12 comes with a solid plastic or folding steel stock. Tube magazine capacity is 7 balls. It is practically possible to fired of everything at the given caliber. From classic shotgun shells, through individual bullets of various materials, to biscuits pressed into nitrocellulose. SPAS 12 manufactured by Tokyo Marui, is one of three manual shotguns, which this company supplies to the airsoft guns market. With three barrels that deliver reliable and accurate performance, is probably the most serial-made manual shotgun in an airsoft guns assortment. What do we find in the package? 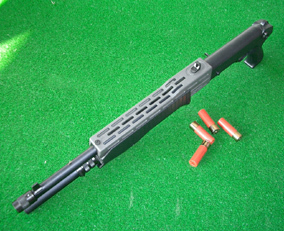 The processing of the shotgun itself and its plastic surfaces is again at a very high level. Very pleasant is a presence of metal components such as gun-barrel, front sight, trigger, fuse, and a magazine. That tubular magazine is even really working. It is accessible from the front and holds two patrons. But, the approach itself is not that easy, so it's better to wear the patrons in your pocket or have them attached firm to the shotgun. 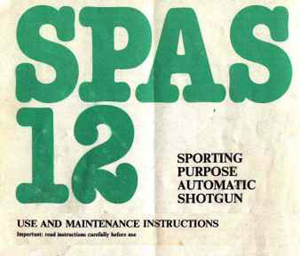 Tokyo Marui SPAS 12 is a very authentic replica, which does not lose its authority and magic against of an original. The cartridge-shaped magazine holds 30BB, which makes up for 10 shots. What? 30bb and only 10 shots? Yes. Really. 10 shots because whenever pressing the shutter leaves the weapon towards the target exactly three balls. Everyone flew out of a one of the three gun barrels, which are equipped with a fixed Hop pre-set at 0.2g BB. In addition, each gun barrel supplies air to a separate cylinder with a piston and that´s meaning there isn´t hence no short range and poor accuracy, like shotguns with one gun barrel that shoots more than one projectiles at a time. Before the shot is must be a weapon loaded. How? Move forward and back forward :) From the beginning, it seems that it is difficult, but you get used to it. If you are not weak, it's not a problem loaded a gun with high frequency. As you already know, the gun shoots 3 BB at a time, so the chance to hit the target is slightly larger than one ball. But how far does it shoot? And what precision is? At 35 m you hit a target of 20x30 cm at least two BB out of three, which is a decent result, right? Therefore, targeting 40 m is not a problem with a little skill. At least one of the three BB always sure. :) Of course, we shoot BB 0.2 grams, which is aligned with that pre-set fixed Hop-Up.